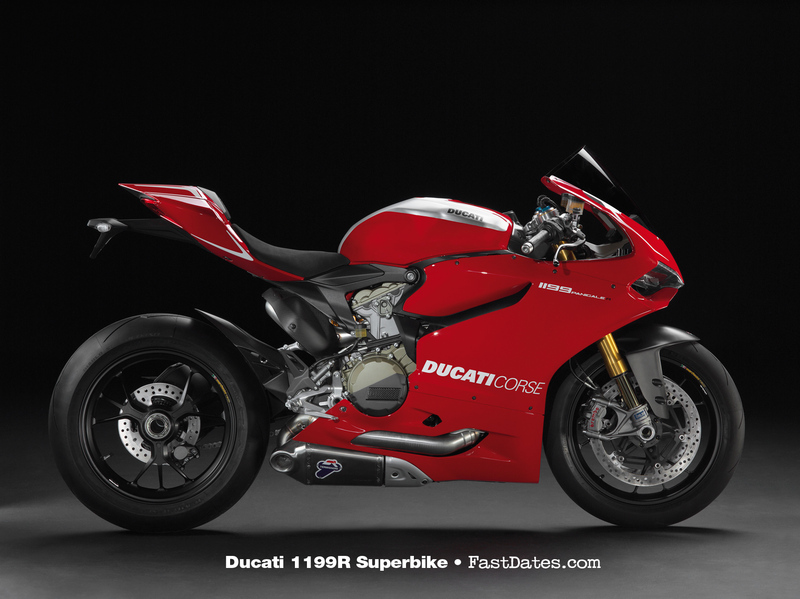 signature Ducati red, in addition to the exclusive 1199 Panigale S Tricolore. 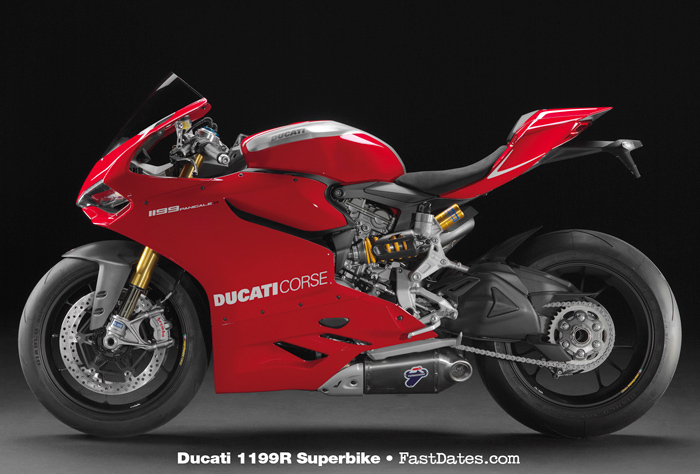 All 2013 1199 models are updated with latest generation engine management mapping and Ride-by-Wire calibration, stated to increase low and mid-rage power significantly over the 2012 Superquadro engine, further enhancing the Ducati Superbike riding experience. This ECU software upgrade is also available now to all 2012 model 1199 Panigale owners free of charge through their Ducati dealers, both for standard exhaust system bikes and those upgraded with the DP Termigoni Silencer Kite, and the Complete Race System as now come standard on the 1199R. 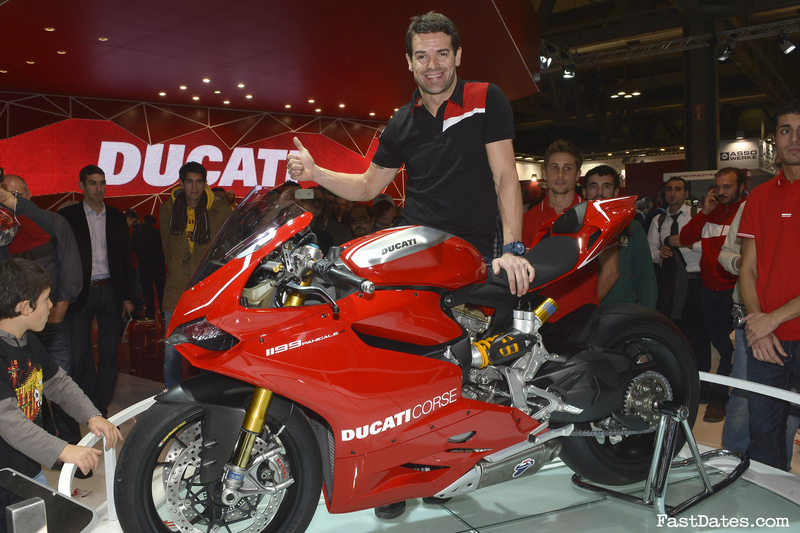 Ducati World Superbike Champion Carlos Checa helped introduce the new 1199R at EICMA. 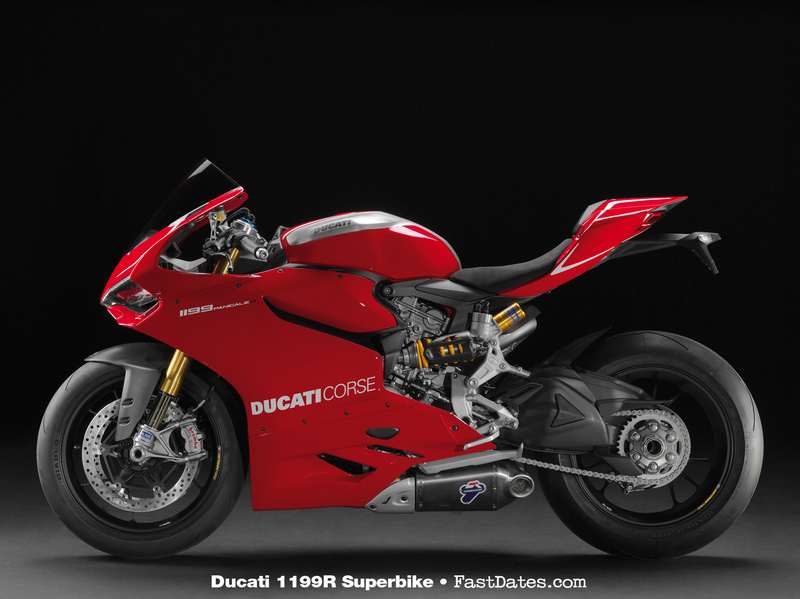 The “R” version of Ducati’s Superbikes has always been the dream model, the machine taken by Ducati Corse and enhanced with high performance preparation for homologation into the highly competitive environment of World Superbike. The 1199 Panigale R model introduces the very latest version of engine and R-b-W mapping to all the 1199 models, improving performance and refining the overall Superbike riding experience. The “R” takes everything that the “S” model is currently equipped with and applies a list of enhancements to the technical specification that enable the model to achieve even greater targets. Titanium con-rods, which save an overall 0.63kg (1.38lb), a 0.7kg (1.54lb) lighter crankshaft flywheel, DLC-coated rocker-arms and revised engine mapping now enhance the Superquadro engine’s crank acceleration and allow it to rev 500rpm higher to a 12,000rpm limit, an incredible engineering achievement for 112mm pistons. Incorporating Ducati’s Riding Mode technology, the 1199 Panigale S and Tricolore are fully equipped with front and rear Ducati Electronic Suspension (DES) system by Öhlins. The 43mm Öhlins NIX30 forks are adjustable electronically in compression and rebound damping, while spring pre-load is manual. An adjustable steering damper completes the full Öhlins package. The Öhlins TTX36 rear unit features twin tube technology to offer totally separate damping adjustment in compression and rebound and minimise the risk of cavitation under extreme conditions. The unit is fully adjustable electronically in compression and rebound damping, while spring pre-load is manual. The electronic suspension adjustment can be made either by using the pre-set Riding Modes, which havebeen developed by Ducati test riders and racers, or in independent mode, which allows riders to use their own personal and saveable settings. Digital damping adjustments send signals that execute the mechanicaladjustment via electronic actuators mounted in the suspension units. 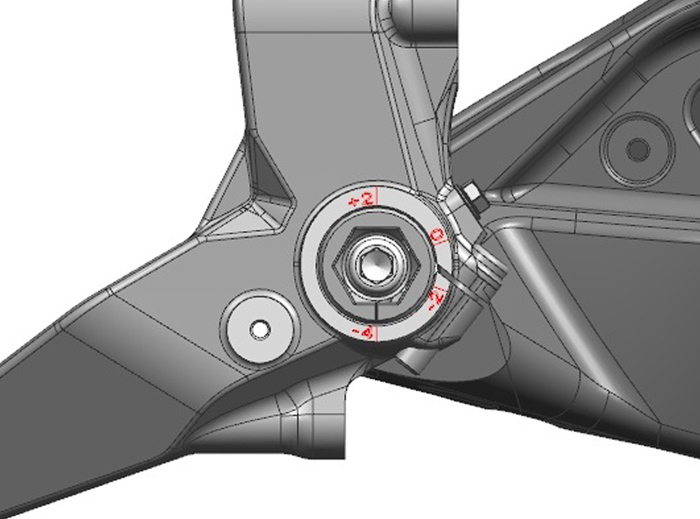 The race-oriented “R” model also features a 4-point adjustable swingarm pivot, designed to enable riders a personalised and precise set-up of varying levels of pro or anti-squat to optimise traction on corner exit. The settings are dialled-in using two user-friendly eccentric adjusters that offer pivot positions at +2mm higher, - 2mm lower and -4mm lower than the standard position, each positively and accurately locked and located. The 1199 Panigale is equipped with many of the latest innovative electronics developed by Ducati on the race track, and they are combined, managed and displayed on full TFT technology instrumentation. First introduced to the motorcycle industry on the Ducati Diavel, the TFT display is super-enhanced on the 1199 Panigale. 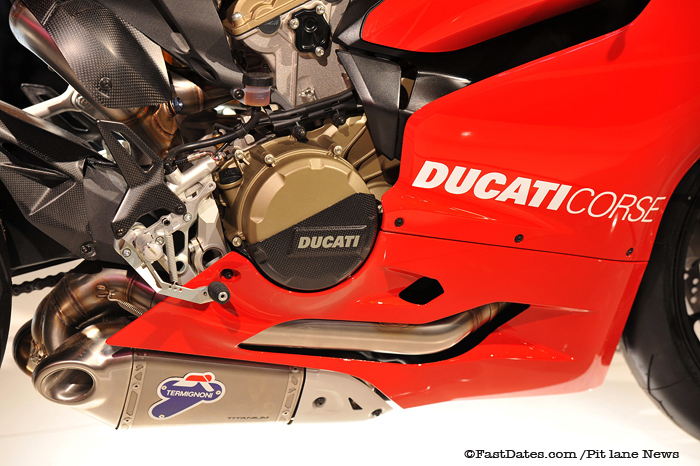 The 1199 Panigale uses a compact version of its Ducati Quick Shift (DQS), first introduced on the 1198 SP and increases its formidable fire power with a sport-intended, adjustable ABS system and Ducati’s Engine Brake Control system (EBC), designed to enhance stability during de-acceleration. 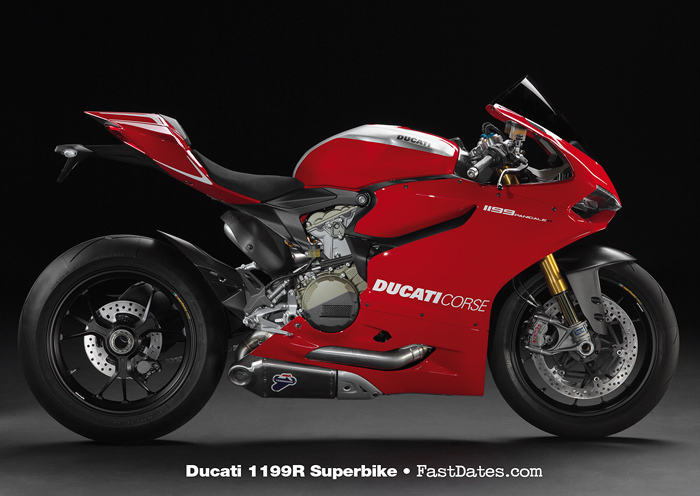 Pricing for the 2013 Panigale Superbike line remains the same as in 2012 with the base model 1199 at $17.995, 1199 w/ABS $18.995, 1199S $22,995, 1199S w/ ABS $23,995 and the new 1199R w/ ABS $29,995. 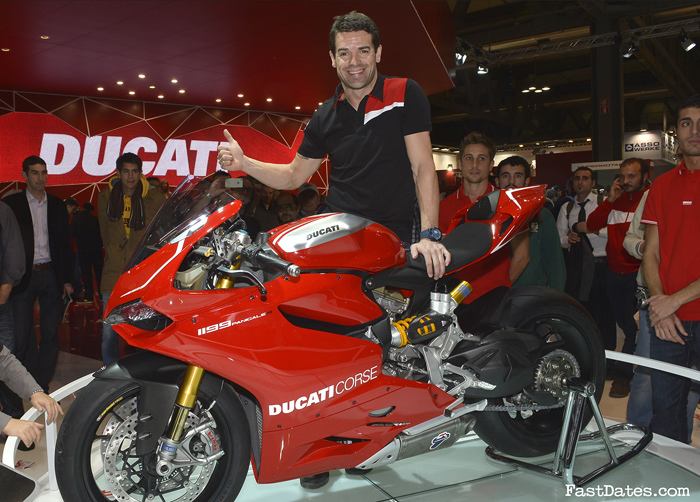 Carlos Checa aboard the new 1199RS Superbike which will spearhead Ducati Alstare's 2013-2014 World Superbike foray. Borgo Panigale (Bologna), 11 November 2012 - A two-year agreement for the World Superbike Championship seasons 2013-2014 has been signed between Ducati and Francis Batta’s Belgian organisation, Team Alstare. Riders, Carlos Checa (Spain) and Ayrton Badovini (Italy) will join Alstare staff ready to prepare for the challenge of the 2013 World Superbike Championship. Powered by the new Ducati 1199 Panigale, the team will officially represent the Bologna-based manufacturer under the title “Team Ducati Alstare”. Team Alstare is renowned for its benchmark professionalism and expertise and its headquarters, at Alleur in Belgium, is among the most technologically advanced in the sport. This impressive set-up combined with the passion of the Bologna factory’s engineers will create the perfect synergy to meet the expectations of the new Ducati 1199 Panigale. Alstare technicians and the Ducati Superbike development team will start working together immediately, with pre-winter tests scheduled to begin at the Aragon circuit in Spain on 14-15 November and continuing at Jerez from 28-30 November. Ducati SpA, Borgo Panigale (Bologna), Italy, 20 November 2012 – Ducati announces the appointment of Bernhard Gobmeier as the new General Manager of Ducati Corse. Utilising his significant experience in the world of motorsport, including more recently his role as Superbike Director with BMW, the position will draw upon the 53-year-old German’s extensive managerial experience ready to enter the new phase of development for Ducati’s racing activities and to achieve the targets set during the recent acquisition by the Audi Group. Mr. Gobmeier will report directly to the CEO of Ducati Motor Holding, Gabriele Del Torchio, and count upon the experience and professional support of Filippo Preziosi. Engineer Filippo Preziosi, the current General Manager of Ducati Corse, will now assume the position of Director of Research & Development for Ducati Motor Holding and report directly to Claudio Domenicali, General Manager of Ducati Motor Holding. The prestigious and strategic company role will enable 44-year-old Preziosi to apply the valuable experience of his 18 years in Ducati, 12 of which in Ducati Corse, to the development of new product. Paolo Ciabatti (55) has been appointed the new Ducati MotoGP Project Director. The Italian now returns to the Borgo Panigale headquarters in Bologna to take advantage of his extensive experience in the world of motorcycle competition, which has included coordinating the World Superbike Championship as General Director. After two seasons in the position, Engineer Ernesto Marinelli (39), is confirmed to continue as Ducati Superbike Project Director, with the activities of both Marinelli and Ciabatti coordinated by Mr. Gobmeier. All appointments will commence from January 2013.
new 50mm lightweight aluminium front forks, Sachs rear suspension and steering damper and with DTC,DQS, EBC and RbW combined into the Ducati Riding Modes. Available is optional ABS Anto-Lock Brakes.